Hi, guys! 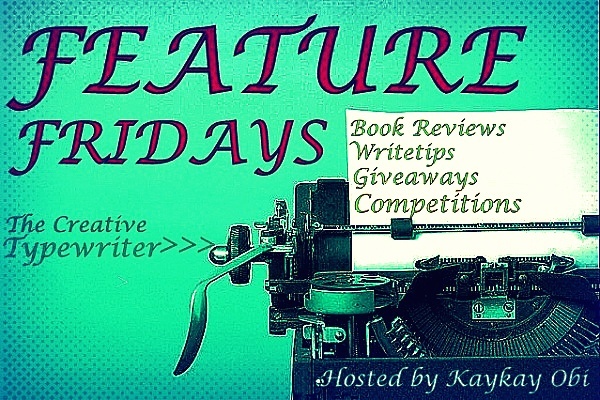 Welcome to FEATURE FRIDAYS! Here I host other blog articles - Book reviews, Writetips, Giveaways, and Competitions. Then I leave a link to the original blog. So If you have anything you would like me to host here, don’t hesitate to let me know. It’s for FREE! It’s true. You can never know when or how the next idea for a novel or the inspiration to continue an existing one, will come. It can come from every little thing. I for example have some experiences to share. The first one is for the novel I just finished (the first draft at least cause I have a lot to do before I can release it.) I had a story in my mind but not specific things. It was summer and I was shopping with my cousin when I heard a little bell ringing from a jewel she was wearing on her ankle. That moment while I was keep walking I saw the image I wanted for my book and the words formed in my mind. And when I did write it after months, when my story demanded it, it just felt right. The second time was again for the same novel. I was in bed trying to sleep thinking the next chapter. I knew how I wanted to continue it, but I just couldn’t make it happen. A small phrase formed in my mind and I just woke up and wrote the whole chapter. It is still one of my favorites. A third time that I can remember is when I was writing my first novel, DAZED. I was actually asleep but an idea crossed my mind like a flash and I took my notepad and wrote half a chapter. The same happened again for the prologue for my second novel. I am sure that every writer has moments like these and I’d love to hear them. So, share it with me if you want. Inspiration can come at any moment and by any random thing and we just have to grab it and expand it, make it a story. There were few times that I ignored my idea and I regretted it, so don’t make the same mistake. Writing has no days, times, hours or holidays. When you write you write full time and every day and night until your work finished and you are ready to read it again and again and again, changing it, making it more beautiful, more precise, making it ready for everybody to read. As writers, our mind never gets peace; at least mine doesn’t…yours? Tell me about it. I totally agree, moments like that always happen to me especially when am trying to get a new theme for a poem. I see myself getting my muse from the very little things that the untrained ear would usually ignore. i occasionally wake up in the middle of the night to right a poem that the words came to me in my dream. Found you! What a lovely post you've put up here. My inspiration comes mostly at odd hours, or when I'm busy doing something else. I wonder why am finding it hard to come via my WordPress ID. So I'm using an open ID instead. Hi, Uzo. The post is courtesy of Athina. Do check her blog out. She has interesting posts I'm sure you would like. I'm glad you enjoyed this one. Excellent post, Athina! And thank you, Kaykay, for hosting it so that I could find it! Some of the best plot ideas I've had came in moments just like you describe. One of the major turning points of my first novel came to me as I was just walking along at my job one day. Hit like lightning and it was one of the best moments of inspiration I can remember. And you're very right. We ignore those moments at our own risk, because usually, they're spot on for what the writing needs and well worth trusting. Thank you again for your post! Yeah, Megan. I get those inspirations when I don't expect it. And that's when my phone's memo or a little notepad I walk around with comes in handy. Very right! Inspiration can come any time... and it doesn't like pressure. And they are very passing. If I don't note them down, it's possible that they are gone forever.